Lizz is off this week but I miss her and so I can feel the impulse to channel something that is about food and nurturance. With fall closing in, and with all the natural (and man-made) disasters swirling around the globe, it seems a good time for an anchoring stew, something that might tether me to the present. 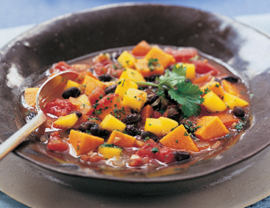 Therefore, I offer you Brazilian Black Bean Vegetarian Stew, courtesy of Vegetarian Times . Yum!